Would you rather have a summer picnic on a paved parking lot or on cool grass under a shade tree near a stream? Many people find pleasure in nature's biodiversity. Perhaps you like to visit scenic areas to hike, swim, relax, or enjoy the views. Many painters, writers, and musicians find inspiration for their work by spending time outdoors. However, beauty and pleasure are not the only reasons why biodiversity is important. Figure 3 Although most medicines are made in factories, many originally came from wild plants. Humans Need Biodiversity What foods do you like to eat? If you eat meat or fish, your meals probably include beef, chicken, pork, tuna, shrimp, or clams. Rice, peanuts, green beans, strawberries, or carrots are plant foods you might enjoy. Eating a variety of foods is a good way to stay healthy. Hundreds of species help feed the human population all around the world. Biodiversity can help improve food crops. During the 1970s, plant diseases wiped out much of the corn crop in the United States. Plant breeders discovered a small population of wild corn, called maize, growing in Mexico. By crossbreeding the wild maize with domestic corn, they developed strains of corn that are resistant to many diseases. Crossbreeding with wild plants also has been used to produce disease-resistant wheat and strains of rice that grow well under drought conditions. Biodiversity provides people with many useful materials. Furniture and buildings are made from wood and bamboo. Fibers from cotton, flax, and wool are woven into clothing. Most of the medicines used today originally came from wild plants, including those shown in Figure 3. [^^^^¡¡¡jJJ^^S Why is biodiversity important to people? Maintaining Stability Forests usually contain many different kinds of plants. If one type of plant disappears, the forest still exists. Biodiversity allows for stability in an ecosystem. The velvet bean plant is the original source of L-dopa, a drug used to treat Parkinson's disease. An extract from the bark of the Pacific yew was traditionally used to treat arthritis and rheumatism. It is now known that the bark contains taxol, which is a treatment for some types of cancer. The bark of the cinchona tree contains quinine, which has been used to cure malaria in millions of people. A loss of biodiversity can weaken an ecosystem. 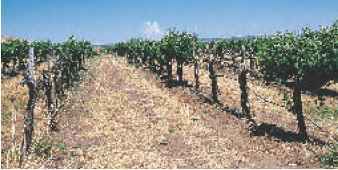 In a vineyard, as shown in Figure 4, vines grow close together. If a disease infects one grapevine, it could move easily from one plant to the next. Soon, the entire vineyard could be infected. Many farmers and gardeners have found that planting alternate rows of different crops can help prevent disease and reduce or eliminate the need for pesticides. Figure 4 Disease has spread from one grapevine to another in this vineyard. 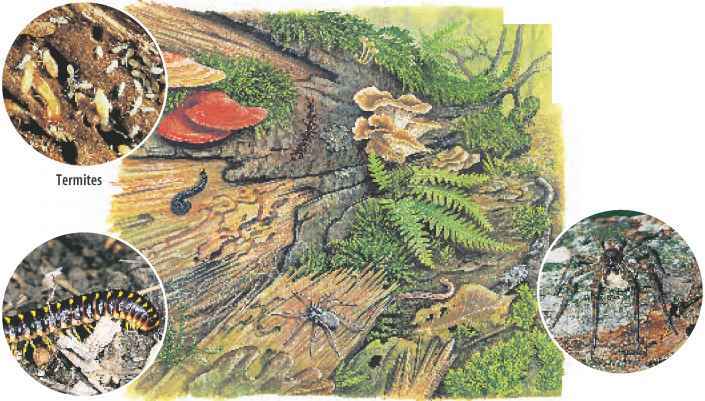 MEASURING BIODIVERSITY Temperate rain forest ecosystems in Alaska and California are similar. Which one has the higher mammal and bird biodiversity?